Most users of MIG welding consume 3 to 5 times (or more) the amount of shielding gas that they should. An article published Trailer Body Builder Magazine, entitled, "How To Save 20% in Welding Costs," quotes a representative from Praxair, a leading supplier of shielding gas stating "A minimum of 5 cubic feet of shielding gas is required per pound of wire, but the industry average is 30 cubic feet." This supported very similar data presented in the the Fabricator Magazine on the subject of shielding gas waste. You can easily calculate the waste in your shop. If, for example, your using .035 solid wire and welding at an average of 150 amps, you are consuming 4.1 lbs/hr of wire. If your using a shielding gas flow at 30 cubic feet per hour (CFH) then dividing one usage by the other you should be using 7.5 CF of gas /lb of wire. If you are using .045 cored wire @ 250 amps your consuming 8.0 lbs/hr. At 30 CFH gas flow setting you should only be using 30/11.6 or 3.8 CF of gas /lb of wire. Both values are far from the 30CF/lb of wire reported. Check out your usage of wire and gas for the past, say 3 months. Don't be surprised if it is more than 2 to 3 times what you should be using. WHY AM I USING SO MUCH SHIELDING GAS? A major cause of the shielding gas waste in MIG welding results from the build up of gas in the shielding gas delivery hose every time welding is stopped. While welding, the gas pressure needed at the end of the hose near the solenoid is only 4 to 5 psi depending on the torch length and other restrictions. However when stopped, the pressure in the hose raises to 25 to 80 psi depending on the type of regulator/flowmeter employed. Excess gas is therefore stored in the gas delivery hose when welding is stopped. That excess can be up to 5 times the hose volume. When welding is started, or even if the wire is inched to cut off the end or position it in the joint, the stored gas is expelled and the excess wasted! The expelled gas is not only wasted, the high surge flow rate also pulls air into the shielding gas stream. This air entrainment creates excess spatter or weld porosity at the weld start. For a mathematical explanation and quantification of the amount of excess gas that is present when welding is stopped visit the Technical Reasons for Gas Waste Page. WA Technology provides a simple solution to this major cause of shielding gas waste, excess stored gas in the gas delivery hose. The patented product is called the Gas Saver System (GSSTM) and incorporates a specially made small volume gas delivery hose which in combination with a gas start surge limiting orifice located at the wire feeder end eliminates excess "gas blast" and waste at each weld start. It quickly delivers sufficient extra gas, at a limited peak flow rate to purge the weld start are and gun nozzle or moisture laden air. The outside diameter of the custom hose is large and it is made with fiber reinforced construction to handle the tough welding shop environment. There is only a small pressure drop in the GSS hose and surge limiting restrictor. The GSS is unique compared to other products which have been proposed to solve this problem over the years. It has no moving parts to wear, need repair or leak, no knobs to adjust or pressures to set. 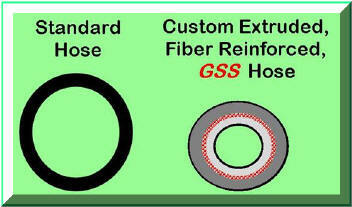 Simply replace the existing shielding gas delivery hose with the GSS. It's unique, patented design maintains the system pressure to quickly provide a small amount of extra gas at the weld start to rapidly purge the air which diffuses into the torch lines when welding is stopped. This controlled amount of extra gas at the weld start also quickly fills the gas nozzle and floods the weld start area with shielding gas. Maintaining pressure preserves the systems ability to automatically compensate for variations in hose restrictions which occur while welding. Unfortunately, in the real world, the hose is often stepped on, kinked or pinched when it is dragged on the shop floor. A high regulator pressure is needed to automatically compensate for increased pressure drop without requiring welder interaction. To provide this automatic feature, it is necessary to have the regulator pressure (measured as absolute pressure or psia, i.e. psi + 14.7 psi = psia) be at least twice as high as any pressure restriction which might occur (also measured in psia). Technical information is available that explains this phenomenon. This is one reason welding regulators were designed with higher pressures! If you have used a simple surge flow restriction orifice at the feeder, you may have reduced the initial gas flow surge but just prolonged the gas waste over a longer time, perhaps 3 seconds. You may not have saved any gas! Lab tests with this type of system are demonstrated in the . Also see "Why you need some extra gas flow at the weld start." It quantifies waste due to surge flow, leaks, ways to monitor leaks and the gas flow settings where air is pulled into the shielding stream. Unfortunately many are using far too much gas flow, wrongly employing the philosophy, "If Some is Good More Must be Better" ! 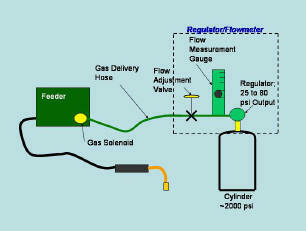 The Patented Gas Saver System Pays for Itself in a Matter of Weeks, SEE THIS LINK.